K.M. Venkat Narayan, director of the Emory Global Diabetes Research Center, received the Marion V. Creekmore Award for Internationalization. Kwadwo Sarpong 15C received the Sheth Distinguished International Alumni Award. Jessica Dworkin, assistant dean of graduate programs at the School of Law, received the International Outreach Award. Emory University Provost Dwight McBride posed with recipients of the 2017 International Awards at the Nov. 16 ceremony celebrating their accomplishments. Epidemiologist K.M. Venkat Narayan, humanitarian and medical student Kwadwo Sarpong and law school administrator Jessica Dworkin are the 2017 recipients of the Office of Global Strategy and Initiatives’ annual international awards. They were honored at a private ceremony Nov. 16. “The International Awards are Emory’s highest honor recognizing the faculty, staff and alumni who make Emory a significant player on the world stage,” says Philip Wainwright, vice provost for global strategy and initiatives. K.M. Venkat Narayan, Ruth and O.C. Hubert Professor of Global Health and Epidemiology in Rollins School of Public Health, professor of medicine in the Emory School of Medicine, and director of the Emory Global Diabetes Research Center, received the Marion V. Creekmore Award for Internationalization. 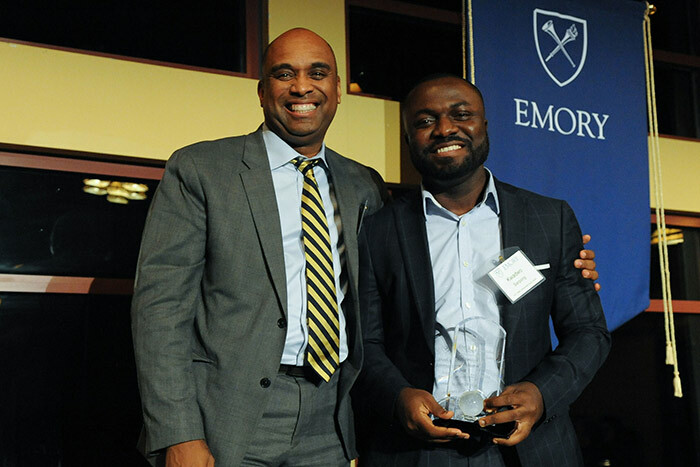 This award is given each year to an Emory faculty member who excels in advancing the university’s commitment to internationalization. Narayan has been an unwavering advocate for global health at Emory. Over nine years, he has cultivated multi-institutional collaborations with partners in India, Pakistan, Mexico, Colombia, Brazil, China, Israel, Cyprus, Ethiopia and others. He and his team have attracted more than $25 million in grant support for their work. 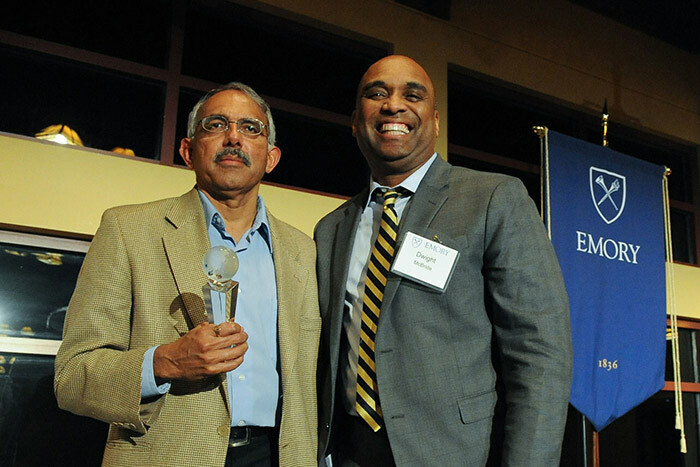 “Venkat's passion for science and global collaborations have helped position Emory as the premier U.S. institution in the global cardiometabolic disease community,” says James Curran, dean of Rollins School of Public Health. The Centre for Control of Chronic Conditions (CCCC), located in Haryana, India, at the Public Health Foundation of India (PHFI), is among Narayan’s most recent endeavors. This partnership between Emory, PHFI, the All India Institute of Medical Sciences and the London School of Hygiene and Tropical Medicine pursues research to reduce the burden of chronic health conditions in low-resource environments. In addition, the CCCC focuses on capacity building and outreach in furtherance of evidence-based public health policies in the region. Prior to his tenure at Emory, Venkat was chief of the diabetes science branch at the U. S. Centers for Disease Control and Prevention. Before that, he was an intramural scholar at the National Institutes of Health and a member of the faculty at the University of Aberdeen, Scotland. Kwadwo Sarpong 15C is the recipient of the Sheth Distinguished International Alumni Award, which recognizes international alumni who are highly distinguished and have made outstanding contributions to humanity, science, art or human welfare. Sarpong is the cofounder, former CEO, and current chair of the board of African Research Academies for Women (ARA-W), a nonprofit organization that seeks to create a research-intensive pipeline program for young African women interested in pursuing STEM careers. A native of Ghana, Sarpong arrived in Atlanta in 2009 with hopes of completing his education in the U.S. He worked as a hospital janitor and as a stocker and cashier at Wal-Mart for 2 years before enrolling in classes at Georgia Perimeter College; transferring to Emory as a junior and ultimately graduating with a degree in neuroscience and behavioral biology. Inspired by the experiences of Ghanaian women in his life who were interested in the sciences but unable to find appropriate opportunities to pursue their research, Sarpong cofounded ARA-W while still a student at Emory, modeling it on Emory’s Summer Undergraduate Research program and enlisting three of his professors to serve on the original board of advisers. “The program is an amazing success because of Kojo's vision. Kojo has attended Africa summits at the White House and has received support from the Bill and Melinda Gates Foundation and the Clinton Global Initiative, as well as from numerous other donors. They've supported four cohorts of women researchers and are now expanding to include both Ghana and Nigeria in their work,” says Leah Roesch, senior lecturer and director of undergraduate research in neuroscience and behavioral biology and former board member for ARA-W.
A current student at Georgetown University School of Medicine and a former PREP (Post-Baccalaureate Research Education Program) Scholar at Icahn School of Medicine at Mount Sinai, Sarpong hopes to become a physician-scientist specializing in neurodevelopmental diseases. His research focuses on evaluating the role of somatic mutations in children with autism and epilepsy. 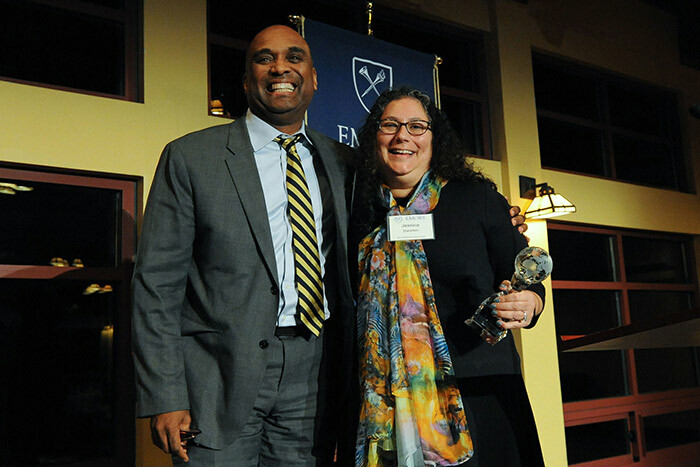 Jessica Dworkin, assistant dean of graduate programs at the School of Law, received the International Outreach Award, established in 2012 to recognize professional staff who have made significant contributions to Emory’s internationalization through the programs, schools and units in which they serve. Dworkin leads Emory Law's overall international strategy and efforts to expand existing graduate programs. Since her arrival in August 2013, she has focused on increasing the geographic diversity and academic strength of Emory Law's LLM program (master of laws for foreign-trained attorneys) through her outreach efforts with institutions in Asia, South America, the Middle East and Europe. Under her leadership, LLM enrollment has increased by 350 percent. Dworkin has helped Emory Law establish several key strategic partnerships, resulting in new international agreements for both faculty collaborations and student exchanges. Among the most notable are new partnerships with Fulbright and with the Public-Private Partnership for Justice Reform in Afghanistan. “As a result of her work, both Emory University and Emory Law have seen their reputations enhanced in professional networks throughout the world,” says Robert Schapiro, Asa Griggs Candler Professor of Law. Dworkin holds a BA with honors in international studies and Spanish from Ohio State University and a JD and LLM in international and comparative law from Duke University School of Law.